Courage of Philadelphia is a local chapter serving Catholic men and women in the Philadelphia & Southeastern Pennsylvania area under the guidance and support of the Archdiocese of Philadelphia. 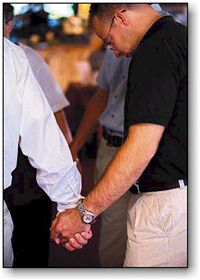 A typical Courage meeting begins with prayer and with an opportunity for individual Confessions. Next, each member is invited to “check in” — to say briefly how he is feeling and what successes or challenges he may have experienced recently. The chaplain often gives a short talk on a spiritual topic or in response to some of the issues raised during the “check in”. Then there is time for open discussion, either on some of those issues, on a particular Goal of Courage, or on some other topic that relates to the shared struggles of the members. When the discussions are concluded, the meeting ends with prayer. Often the meeting is followed by time for socializing, over a meal or some other activity. At the present time, meetings are held twice a month in Center City Philadelphia. Plans are underway for meetings in Delaware County and Chester County in the near future.